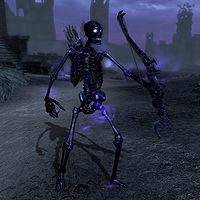 Bonemen are black skeletons found within the Soul Cairn. You can summon them to fight for you after learning Conjure Boneman from a spell tome in the Soul Cairn. Like other creatures found in the Soul Cairn, bonemen leave behind a pile of black "soul ashes" when defeated. These yield a random-sized soul gem and a Soul Cairn alchemical ingredient, and have a 10 percent chance of containing an inexpensive piece of jewelry. Durnehviir, whether fighting for or against you, will summon bonemen in combat. Bonemen can also be encountered in Brittleshin Pass during the quest The Staff of Hasedoki as part of the Staff of Hasedoki Creation. They will immediately disappear once you kill Ivara of Olenveld and Lushak gra-Ragdam. This page was last modified on 27 October 2018, at 13:35.